A Weight Loss Drink at the Academy’s Annual Expo? Keeping with yesterday’s post about the candy lobby’s presence at last year’s Academy of Nutrition and Dietetics’ Food and Nutrition Conference & Expo, here is another example of why the Academy needs to establish guidelines regarding what sorts of companies and products can purchase booth space at the expo. Almased Synergy Diet — which promises “quick and permanent weight loss” — is nothing more than a powder composed of soy protein isolate, honey, skim milk yogurt powder, and fortified vitamins and minerals. 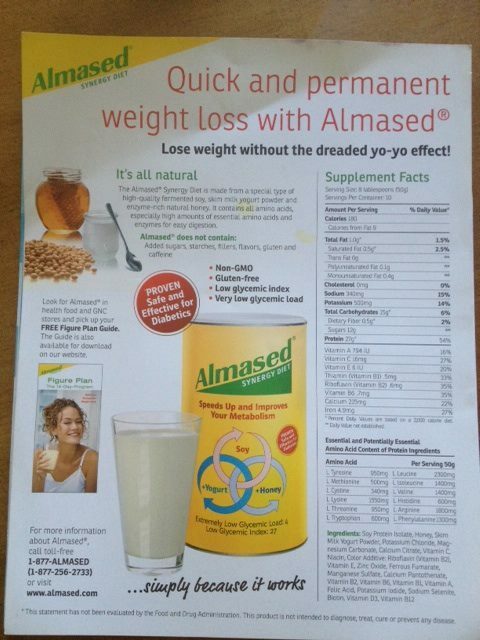 Not surprisingly, Almased claims the mix of their “special type of high-quality”soy, “enzyme-rich” honey, and skim milk yogurt powder helps people lose weight “without the dreaded yo-yo effect”. They even go as far as stating there are no added sugars in this product, despite honey being the second ingredient. Visit their website and you see the usual content, about how Almased in combination with a lower-calorie diet and consistent physical activity can help with weight loss. This reads like an overhyped and gimmicky weight-loss advertisement should have no place in a nutrition conference. Above all, we want the Academy to realize that, along with the companies they choose to take funding from and partner with, the presence of any company at the annual expo also implies endorsement. The best way to give more credibility and authority to the RD credential is to be more judicious about these decisions.